Since June of 1997, KKFR — both at its former home on 92.3 FM, and at its current home on 98.3 FM — has made hip-hop and R&B the primary focus of its Rhythmic CHR format. However, around January 1999, the station began incorporating elements reminiscent of its days as a more traditional Rhythmic CHR in the early and mid-90’s. Heard here are the first two editions of “The Power Workout at Noon” mixshow (recorded 16 years ago yesterday/today), which featured more Dance music than the station had played in quite some time. 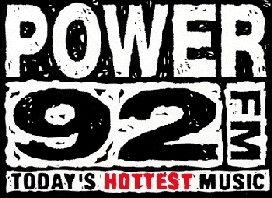 As shown above, the slogan had transitioned from “Where Hip-Hop Lives” to one that Power 92 had used twice before — the presumably more advertiser-friendly “Today’s Hottest Music”. Eric Edwards joined Geoff St. John as the voice of the station. Edwards was the primary voice on Power 92 in the early 90’s. Selected Dance and Pop selections returned to the regular-programming playlist. Eiffel 65’s “Blue” and *NSYNC’s “(God Must Have Spent) A Little More Time On You” are the first two that come to mind. Also, Chuck Reily was also the voice of Power 92, Power 106 LA and also on Hot 97 in NYC.